A NF525 certified POS and a powerfull backoffice. Manage your points of sale with a solution that is 100% connected. Street vending? Store? Through a network of stores? 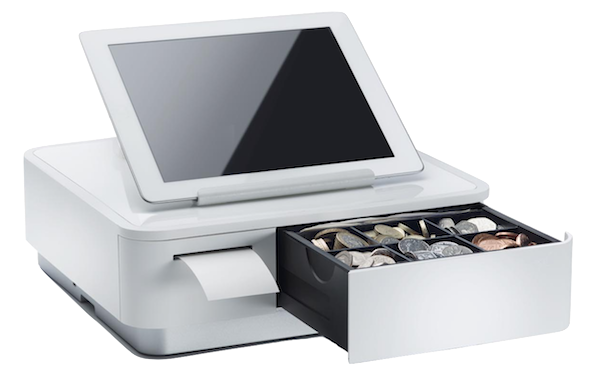 The iPad cash register is made for you! Connect your cash register and ticket printer. Install the app on your iPad, connect the hardware and the cash register is ready: ticket printing, management of barcodes, unlimited salespeople, X and Z cash register, discounts, offers, credits, customer account - you have everything you need! Accept credit cards, Apple Pay or Android Pay. You won’t need a banking and small company contract to cash in sales made with a credit card. 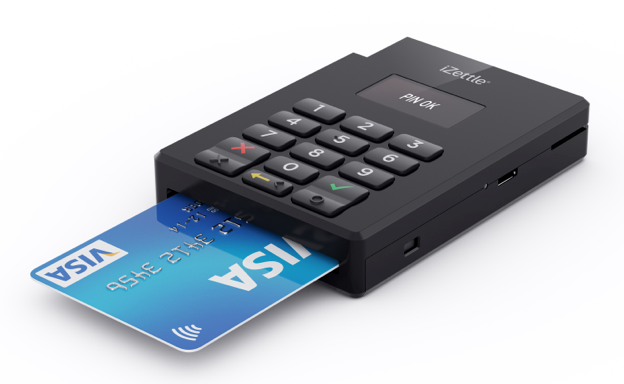 With the iZettle reader, accept credit cards, Apple Pay or Android Pay for all your sales, either wired or wireless! Log onto the Cloud console to manage your product catalog, stock and purchase orders, restocking of by-products, customer loyalty, real-time tracking, etc. Do you also sell on a web store? No problem, your sales will be consolidated in the back-office. 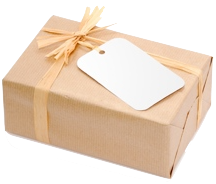 The cash-register "incwo POS" is integrated to the standard subscription packages for less than €20 Excl. Tax/month. The BASIC subscription includes access to a cash register on iPad (no limit on the number of salespeople), and online access to the management interface. Find details on Pricing Page. Is the cash register hardware included? The cash register hardware, in other words, the iPad, cash register, ticket printer, barcode scanner, payment terminal or the mounting bracket to your countertop need to be purchased separately, directly from a provider of your choice. Do you recommend any hardware? iPad: compatible with any version of the iPad with iOS10. How is the hardware connected? Connect your iPad with Wi-Fi to your ADSL box. The cash register hardware connects to the Ethernet ports of your ADSL system, except for the drawer which plugs into the ticket printer. We need several cash register for my store: is this possible? Yes, you can use as many cash register as you wish. The amount of cash registers included in each subscription package is indicated on Pricing Page. If I don’t have an internet connection in my shop, can I use the cash register for the management of my business? The 'incwo POS' app is available in offline mode. You can receive payment and edit your tickets without an internet connection. Also, even if you have internet access and the connection is interrupted, you can continue receiving payments without constraint. 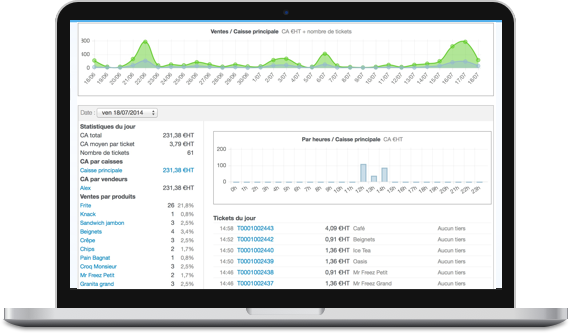 The income network and your data will be synchronized and accessible on your Cloud management console. Can we use your cash register solution for stores outside the eurozone? You can set your currency to edit tickets in the currency of your choice. Does the cash register adapt to any type of business? The cash register is designed for any type of business, from food retail stores (grocery, bakery, snacks, winery, etc. ), to services (hairdresser, beautician…), or clothes shops, decoration, tableware, etc. The cash register is still missing seating plan management for restaurants. Are the cash register updates free? The updates and maintenance are carried out free of charge and automatically by incwo.com. You benefit from the development of our tools without extra charge. Can I customize my ticket? You can decide what appears on your ticket and upload your logo. Who can connect to the cash register on iPad? Salespeople you gave authorizations to and for whom you’ve created an access. Do salespeople have a secure access to the cash register? When adding a salesperson profile, you associate a secret access code to their identity. They will have to enter the code upon any connection to their cash register, and to identify themselves or collect payment. Is the number of salespeople accessing a cash register restricted? The app is multi-salespeople. You can add as many salespeople and checkout managers as you want on the same cash register. Who can connect to the cloud management interface? Users that you authorize from the Users Account Management module of the online application. Must a salesperson have a user account on the web interface to connect to the cash register on iPad? These are two separate dimensions. A salesperson can have easy access to the cash register on iPad, without having a user account on the business management interface. Set your shop and your ticket parameters. Name your cash register and appoint your salespeople. Synchronize your product catalog with your iPad. If you do not have any products on your web application, visit the “products catalog” module to register your products and categories and on the “cash register” module to configure your cash register and your salespeople. The activity management interface is accessible online via the web browser of your computer. Your data is on the Cloud, hosted on our servers. Sales performed by the cash register are recorded on the app "incwo POS" of your iPad, and are uploaded to the Cloud in real time if network is available, or otherwise every hour.